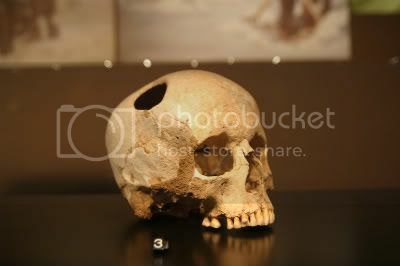 Trepanations (putting a hole in someone’s skull) are the world’s oldest known surgeries, which is pretty fascinating when you think about it. There are skulls thousands of years old which actually show signs of healing after such operations, implying the patients survived the surgery. Well, we can add to the evidence of ancient neurosurgery. They’ve uncovered a young ancient Greek woman who appears to have had her head popped open after suffering some head trauma. Site excavator Ioannis Graikos said the woman’s skeleton was found during a rescue dig last year in Veria, a town 46 miles west of Thessaloniki. “We interpret the find as a case of complicated surgery, which only a trained and specialized doctor could have attempted,” Graikos said. A bone expert who studied the find said the skeleton belonged to a woman of up to 25 years old who had suffered a severe blow to the crown of her head, Graikos said. The operation was apparently an attempt to save her life. He said the clearly defined shape of the hole left in the woman’s skull was a sign of relatively sophisticated surgery.